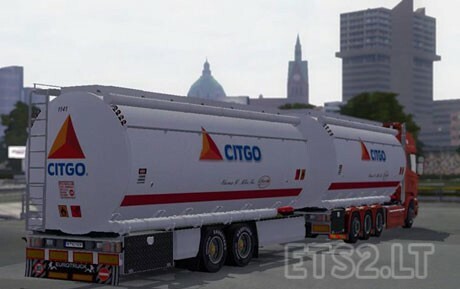 I decided to do a Citgo tandem, using a Scania Streamline truck. There’s only 1 file that you add into your mod folder. Are the tankers going to be as plentiful to get as the boxes are.I tried to get flemming to make a file to make the tanker the only item to be picked up but it never happened, I think he ignored me.The tanker is the only type there is no mod for and there is a lot fewer when running the BDF and tandem mods. 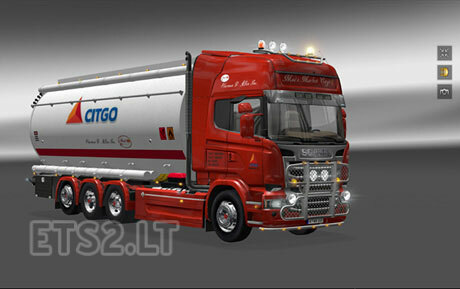 I hope you will be making a lot of tanker skins I love the tandem mods. I live in TEXAS and I saw an actual Estes tandem on I20 yesterday. Your tandem mods are a 10 out of 10 score in my book and I think they will be very well accepted for the game and they are a lot easier to drive . Thanks again Robert. Hi, and thank you – I can’t promise you that they will be plentiful in the game, but there is a specific file here, http://forum.scssoft.com/viewtopic.php?f=35&t=126098, and if you scroll down the first post – you see this: If you want to drive with Painted cistern and want all chrome cistern trailers to be Painted aswell then download this mod here and activate it.